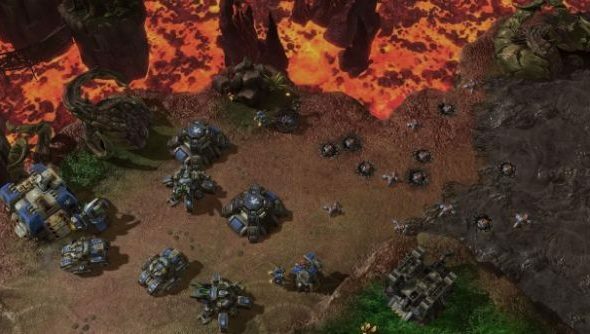 Blizzard have just last night published a new version of StarCraft II’s balance test map to the great PC strategy game‘s Custom Games list. Catchily titled ‘(2)OvergrowthLE (2.1.3 Balance v1.1)’, it’s seen tentative changes to one unit that’s made its mark on the competitive game since Heart of the Swarm – the Terran widow mine. The developers are testing new changes to the widow mine’s splash damage. On the test map its radius is now 1.75, and there’s no compensation for being caught on the edge of the zone. Instead, units that disturb the mine at any point in its radius will be hit for a full 40 splash damage. “This lessens its power against Probes, returns the Widow Mine to how it used to be against Zerg, and provides big improvements against Protoss armies in the mid and late game,” explained Blizzard’s David Kim. That’s a u-turn from a StarCraft II balance patch released less than a year ago, which introduced the idea of reduced damage according to distance. That initial nerf followed the dramatic use of widow mines in the WCS 2013’s Korean semi-finals against ForGG. Elsewhere, the Protoss’ Mothership Core has had its Time Warp duration decreased from 30 to 10 seconds – and Thor, the walking Terran gun-battery, will now prioritise its AA weapon over its AG weapon. How do you like your widow mines? Splashed gradually or all at once?